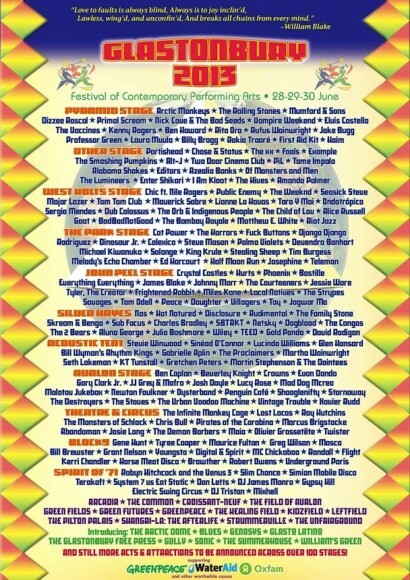 The Glastonbury 2013 Festival has officially released the lineup for this summer, which includes some major headliners such as the Arctic Monkeys, The Rolling Stones, Mumford & Sons, Portishead, and so many more. See after the break for the full lineup and artwork. This year’s Glastonbury Music Festival, which is set to take place June 28th-30th in Pilton, UK this summer is certainly making up for the fact that the event had to be cancelled last year due to a shortage of police officers and portable bathrooms, which were needed for the 2012 Olympic Games held in London, England. 2013’s lineup is pretty stacked, and includes many acts and even a headliner from the Coachella Music & Arts Festival 2013. Since there are too many amazing acts to highlight this year, we invite you to check out the lineup artwork and our text lineup below. And still more acts & attractions to be announced across 100 stages!